"Pay attention to the cut of lamb used in this recipe. I used lamb shoulder chops, which are a fantastic value, when you consider flavor, useable meat, and price. They will probably be the cheapest lamb at the store, have more flavor and richness than leg meat, and are cheaper than shanks and loins. It takes a while for the meat to braise and fall off the bone, but it's a wait rewarded with tender, succulent chucks of lamb." Season lamb shoulder chops with salt and black pepper. Heat oil in a large heavy skillet over high heat. Working in batches, cook lamb shoulder chops until browned on both sides, 3 to 5 minutes per side. Transfer chops to a stock pot. Cook and stir onion with a pinch of salt in the same skillet over medium heat until slightly softened and edges are browning, about 5 minutes. Stir butter into onion until melted; add flour and stir until onions are coated, about 1 minute. Pour stock into onion mixture; bring to a boil, add rosemary, and stir until mixture thickens, 5 to 10 minutes. Stir carrots and celery into pot with lamb shoulder chops and pour chicken stock mixture over the top. Add water as needed to cover meat completely. Bring mixture to a simmer, reduce heat to low, cover the pot with a lid, and cook until meat is almost falling off the bone, about 1 1/2 hours. Transfer meat to a plate. 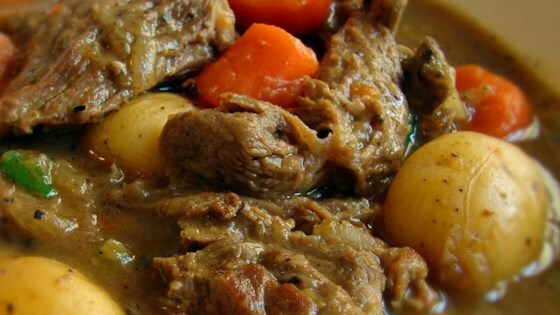 Stir potatoes into stew and return meat to stew, placing on top of vegetables. Simmer, covered, until potatoes are tender and meat is falling off the bone, about 30 minutes. Transfer meat to a plate using a slotted spoon. Bring stew to a boil and cook, skimming off fat, until stew is reduced and thick, 10 to 12 minutes. Remove meat from bones; discard bones and any pieces of fat. Stir meat back into stew. Stir green onions into stew and season with salt and pepper to taste. You can substitute 1 bottle dark beer plus 1 1/2 cups chicken stock for the chicken stock. Made this with pork stew meat. (Lamb wasn't available at the time). I made it in a crockpot, cooking it for about 6 hours. It turned out fantastic! I used sweet potatoes instead of Dutch yellow. Best lamb stew EVER!!! This was incredible! Made better by using local Ontario lamb.